hall – allowing students to play an active role in their education. 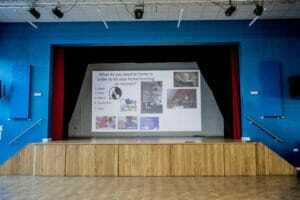 In addition to the Large Venue Series, network manager, Neil Bridson, invested in 25 of Casio’s entry-level Core projectors to roll out across the school’s classrooms and replace existing lamp-based projectors. The lamp-free feature and five-year warranty were both important factors when it came to the purchasing process, he says. We checked-in with the school to see why they chose Casio and what rewards the school has reaped. This is an important investment for the school; what led you to make the change and upgrade your projection technology using Casio? This was a school-wide install, how did you ensure it went smoothly and with minimum disruption? What has the impact of the school’s new 4K projection technology been for teaching staff? The school has seen many benefits – to learning and teaching environments as well as cost and time efficiencies. For example, the main assembly hall where the Large Venue Series is located is also used for mock exams. A visualiser has been plugged into the projector enabling teachers to display results and walk pupils through the answers to provide a totally immersive and engaging learning environment.